Cleveland, OH (December 19, 2014) – The Greater Cleveland Automobile Dealers’ Association (GCADA), its board and member dealers jumpstarted the Greater Cleveland Food Bank’s holiday matching gift challenge with a $50,000 donation to help fight hunger in Northern Ohio. Louis A. Vitantonio, president of the GCADA, along with Ken Ganley, president of the Ganley Auto Group, Chuck Gile, president of Motorcars Honda and Motorcars Toyota in Cleveland Heights and Frank Porter, president of Central Cadillac in Cleveland, made the presentation to Kristin Warzocha, president and CEO of the Greater Cleveland Food Bank to kick off the campaign. As a part of its holiday matching gift challenge, every dollar donated by the public to the Greater Cleveland Food Bank during the month of December will be will be matched by funds donated by the GCADA and other organizations. The matching gift challenge from the Greater Cleveland Food Bank also includes additional money from the Dominion Foundation, the Mindful Mondays group and other generous individual donors. Normally, every dollar donated by the public helps the Greater Cleveland Food Bank deliver four meals. But this month, because of the matching gift pool, every dollar the public donates helps the Food Bank deliver eight meals. GCADA Staff and member dealers are joined by representatives of the Dominion Foundation, packing boxes of vegetables at the Greater Cleveland Food Bank’s headquarters. 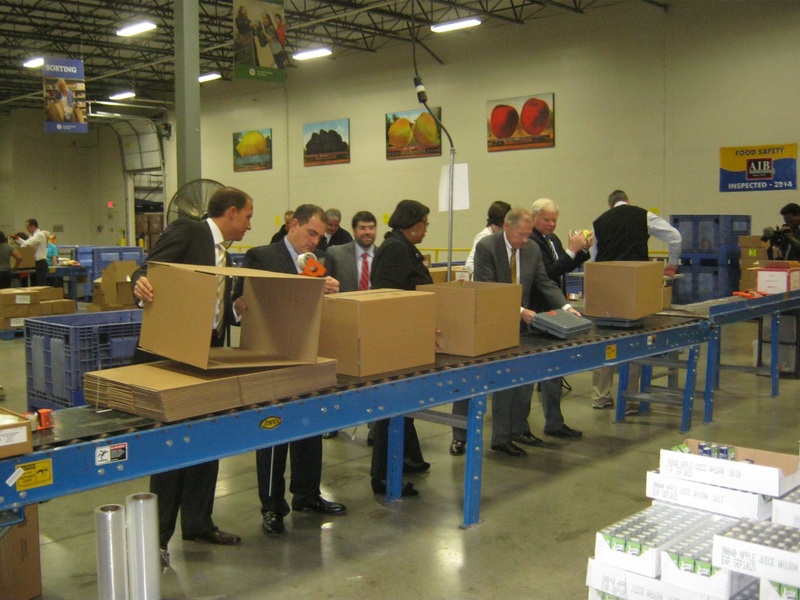 Following the check presentation ceremony at the Food Bank’s headquarters on Waterloo Road, dealers went to work, packing boxes of vegetables that would be sent to the Greater Cleveland Food Bank’s member organizations across Northeast Ohio. The Greater Cleveland Food Bank provides a very vital link between food and hunger, supplying the majority of food used at local hot meal sites, shelters and food pantries. In addition, the Food Bank also provides food to child care centers, group homes and programs for the elderly, working closely with other Northeast Ohio hunger relief organizations such as the Hunger Network of Greater Cleveland, the Catholic Hunger and Shelter Network and the Salvation Army, among many others. In addition to making its donation to the Greater Cleveland Food Bank, the GCADA also announced its new Executive Committee for 2015. Chuck Gile of Motorcars will serve as the 2015 Chairman, while Ken Ganley will serve as First Vice Chairman. Robert Morris of Morris Cadillac Buick GMC in North Olmsted has been named the Second Vice Chairman while Dave Waikem of Waikem Honda in Massillon joins the committee as its incoming Treasurer. The Greater Cleveland Food Bank is just one of many charities supported by the GCADA and its member dealers every year. In addition to its donation to the Food Bank, the GCADA supported dealership employees and their dependents with over $125,000 in post-secondary school scholarships last year alone. Virtually every one of the more than 250 GCADA dealerships in Northern Ohio supports some charitable cause on an individual basis as well. Obviously, when you shop at a GCADA member dealership, you’re helping the support the Greater Cleveland Food Bank. However, the GCADA and its member dealers are also encouraging everyone to make a contribution to the Greater Cleveland Food Bank during its holiday matching gift challenge.